I have 2-1/2 pairs of socks to knit. The 1/2 pair represents the Trekking socks for #1 Son. I’m up past the heels now (no new pics, sorry), so should be finished with these soon. They need to be finished by 10/14, when he leaves for 5 weeks of touring. I cannot see him go off into the cruel world without warm feet. They’re going all the way to Florida. The other two pairs of socks are meant as Christmas presents. But, with the number of unfinished and dying-to-get-on-the-needles projects I have around here, I think it best that these socks be the next two projects I complete. So isn’t it handy that, starting October 1st, we have a whole month of Socktoberfest! Of course I signed up! If you’re planning anything sockish for the near future, go on over to Lolly’s place and get your own button! Here’s my plan for the whole world to see: #1 Socks will be finished before 10/1. That gives me 3 days to do the ankles. Piece of cake. Right? The other two pairs of socks will be finished by 10/31. One pair is for a man (i.e. bigger feet so will take longer). 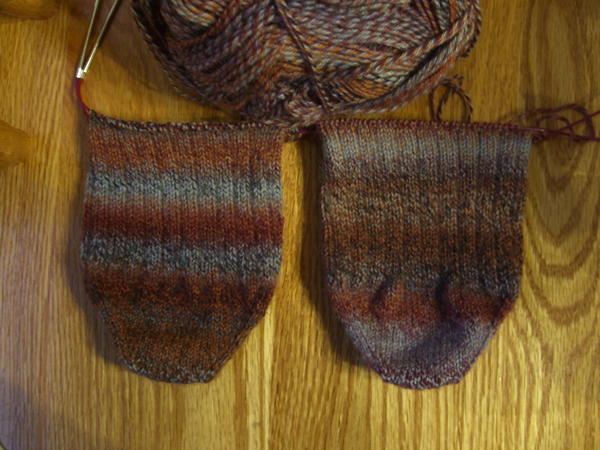 I think this pair can be finished by 10/15, which gives me the remaining 15 days to knit a pair of women’s socks. Yeah. I think that will work. Maybe I’m nuts. (OK, peanut gallery — I hear you out there) But I think this is possible. How about you? Think I’m crazy? Think socks are a good thing? Wanna join? Let’s join forces and encourage each other, eh? Yesterday dawned clear and warm – just demanding that the day be spent outdoors. How many more days like this will we get? And, conveniently, yesterday was the second day of the Oregon Flock & Fiber Festival in Canby. This happy goat owner was kind enough to let me pet her friend – who apparently really likes both people and cookies. I fantasized about taking this boy home to serve as a bed-warmer on those cold winter nights. Can you imagine running your toes through that lovely cashmere all night? The owner helpfully suggested that the horns would also keep the blankets from weighing down my feet. I doubt that the resident kitties would appreciate a new bed-buddy, though. Alas my fantasy had to be abandoned. And then there were these lovelies. Look at all that beautiful angora! Doesn’t it make you want to grab your needles and start knitting? OK… I know there’s a bit of prep work that needs to be done before this fiber is ready for the needles. And since I’m not a spinner I rely on others to do that prep for me. But I am aware of all of the work that goes into it. We both laughed, but she’s right in that I probably don’t really need another money-sucking fun hobby. And lest you think, gentle reader, that I’m fixated on goats, here are some lovely Jacob sheep. Who wouldn’t fall in love with their spotty beauty and those amazing horns? It was dark in the barn, and my pictures of the alpaca, the other wonderful kinds of sheep (there was merino, just walking around! ), and the bunnies weren’t very successful. I can report that no living creature so resembles a tribble as an angora rabbit does. With some of them it was hard to tell which end was which! Both ends, though, are covered with amazingly soft fur. They would make good feet warmers, too. I do think there were fewer animals and more vendors than last year. I hope that’s not a trend, as I really like the animals. Actually, it would be great to have a ton of animals and a ton of vendors. For those who prefer their fiber a little more processed, there were two buildings crammed to the gills with all things fibery, from bags of fleece to roving to silk to yarn. Want a new spindle? There were several booths with gorgeous spindles. Organic, natural-color cotton? Nostepinne? Books? Cashmere socks? Lace shawls? It was all here. And yarn… yarn of every fiber that could possibly be spun. Yarn of every weight from the finest cobweb to the heaviest bulky. Yarn for knitting, yarn for weaving, yarn for crewel, yarn for tatting — yarn just for the sake of yarn. What more could a yarn collector ask for? I knew I was in heaven. Of course, one of the first booths I came across was Blue Moon. Did you know that Sock Candy comes in about a gazillion solid colors? That whole rack in the front is all Sock Candy. I’m sorry for the blurry nature of the picture. My hands may have been shaking. Just a little. Outside there was sunshine, food, spinners, spinners and more fiber. A whole circle of spinners – both women and men – sat in the shade under the trees doing cool things with their wheels. There were spinners everywhere. See at the table? Someone spinning with a drop-spindle. Everywhere I looked there were spinners. I kept thinking I’d really like to know how to do that. It looks so cool! Thus my comments about learning to spin to the fair-goer who asked about my socks. But one hobby is probably enough. Music at OFFF this year was provided by The Standing Stones from the Bay Area. They played songs from their CD Give Fleece A Chance, an international collection of songs about sheep, shearing, wool, spinning, weaving, and all other things sheepy. Shearing songs on harp. It was great! Unfortunately I missed actually getting the CD. I was busy knitting and talking. Several people came over to ask me about my socks. One woman asked if I was knitting two socks at once in order to make sure they striped the same. I looked at the randomly-striping Trekking and thought to myself that if that were the case I wasn’t succeeding very well. Out loud, to the vast amusement of those around, I told the truth: I do it this way because I would never otherwise knit the second sock. When I finished chatting, I noticed that the music had stopped. I turned around and the band was gone. I looked for a website for them, but can’t find one. If anyone knows where to get this CD, please pass the info along to me. It would be was great music to knit by! One more picture from the fair. And sorry that this picture turned out so badly. Forgive my horrible photography, please. On the left… a sheep. On the right… a dog. Notice that, although they are the same color and have almost the same length of pelt, the dog is about 10 times bigger than the sheep. That dog is bigger than some of the alpaca I saw in the barn. That is easily the biggest dog I have ever seen in real life. It was a very nice, dog. Very mellow. I was tempted to ask the owner if she shears him yearly, but I restrained myself. And, before you ask, the sheep was being led around on a leash and didn’t seem to mind at all. A most satisfying end to a most satisfying afternoon. On the way home, I took the opportunity to ride the Canby Ferry. I’m a sucker for ferries. It’s only a short ride across the Willamette River. But I still think it’s fun. And at $1.25 per one-way ticket, it’s a pretty cheap amusement. I held the camera out the window of my car to take this picture. I was first in line so I’m right at the front of the ferry. See how beautiful it was on the river? Now… Last year I didn’t buy anything at OFFF. I was so overwhelmed by all of the yarn, that I couldn’t choose showed admirable restraint by coming home empty handed. There might have been just a tiny, tiny, wee amount of stash enhancement. At the bottom on the left are a hank of cobweb-thin angora lace weight and a hank of merino lace weight. There is about 1300 yards of each, so there’s plenty enough for a couple of really nice shawls. At the bottom on the right is bulky weight organic, naturally colored cotton. The color washed out in the picture. In real life it’s a bulky strand of something between an ecru mixed with celery wrapped by a thin strand of cream. It’s unbelievably soft. I haven’t decided what to do with this yet. I have about 270 yards. Maybe a hat, or a scarf? And here is the progress on #1 Son’s socks! This is Trekking XXL in colorway 101. I’m using my standard sock non-pattern with a 3×1 rib. Have you ever noticed that guys have really big feet? Sorry for the rather dark picture. At 6:00 AM on a gloomy autumn morning, there’s no natural light anywhere. And the sun is just about to dip below the mountain for the winter, stealing my light until next spring. thatâ€™s an interesting structure on the Karabella Aurora 8. It looks at first like a single, but then up close it looks ??? very plied, or cabled? It’s plied. A lot. I unwound the end a little in this picture so that you can see the structure of it. It’s not cabled at all. It’s 100% merino and very, very soft. I’ve seen other blankets made from this yarn and they’re really snuggly. Just the thing for a cold winter evening. By the way, Shelly, will you be at Oregon Flock & Fiber this year? If so, I’ll come by and say howdy. On an entirely different note, I’m not sure what prompted this post two years ago today. But I’m pleased to announce that I don’t have a pile of left-over parts. And, although I’m not yet quite willing to admit that it was all fun, it certainly has been rewarding. Arrgghh, matey. Today be International Talk Like A Pirate Day. But that’s all of that you’ll get from me, I’m afraid. I will have to walk the plank. I do appreciate the compliment! But this is not my own pattern. It’s actually a pattern from Manos del Uruguay. You can find the pattern at this link. But I got the pattern from Tangle, where it seems to be the blanket of the year — i.e. everyone it seems is knitting one. 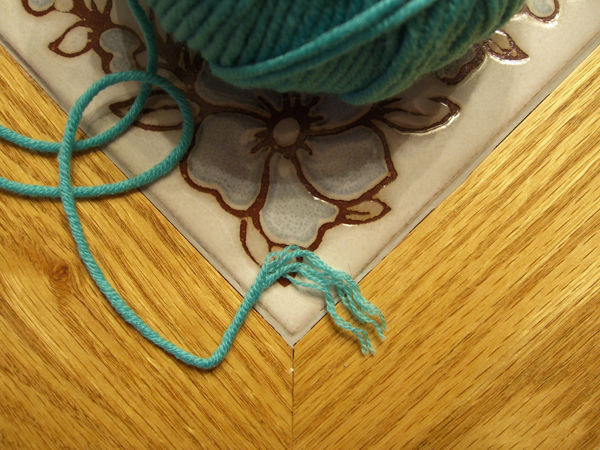 I suspect that Manos meant to have their yarn used with their pattern. 😉 But I’m using Karabella Aurora 8. It’s soooooo soft and cozy. And I want a bigger blanket, so mine will be 4 blocks x 5 blocks. And I don’t want any lace blocks with holes in the pattern, so I will substitute a different stitch pattern for those blocks. I can never leave a pattern well enough alone. If #1 Son ever doesn’t want his blanket, I’ll be happy to take it off his hands. Speaking of #1 Son, when I came home after work yesterday he was there — doing laundry and eating my food. Which I didn’t mind at all! And a little secret was revealed — the reason for his trip to Tangle. Propped up in the place where I always toss my purse was an envelope. When I opened it, I found a card and a Tangle gift certificate, just because. Do I have a great kid or what! I suspect that the environment inside a LYS was a little bit out of his comfort zone. But he said Alice was really nice and helpful. Remember back at the beginning of June when I posted this picture? It’s always such a long wait, it seems. 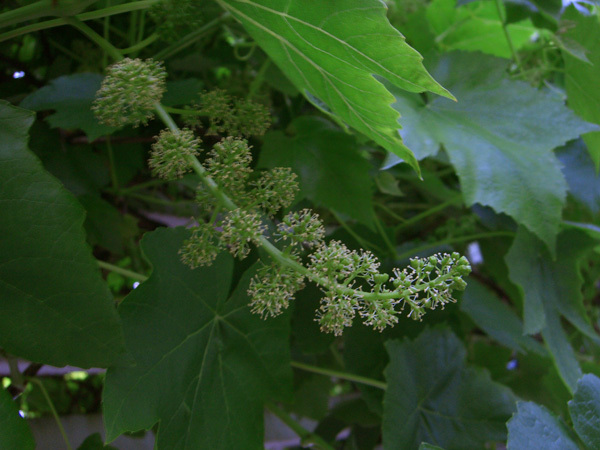 And the grapes are such teases. The summer isn’t very old when I can look out and see lovely green globes hanging down. They look sooooo good to eat. Eat my grapes in July, and you will know the meaning of the word “sour.” Ditto for August. Some time after school starts I test a few, and those in the know begin to ask are the grapes in yet? Maybe next week, I tell them. Or the week after. My grape harvest lasts for a month or so. These in the picture are very, very edible right now – nice and sweet. If I leave them on the vine a little longer, they will become a beautiful golden-green, taste like honey inside, and will almost be too sweet. 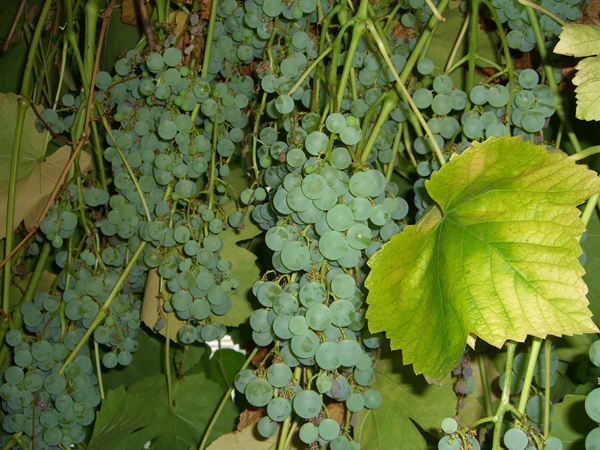 Here is my awful secret: What do I do to grow such prolific and wonderful grapes? uh… not a blasted thing. I have two vines that are about 10 years old now, but have been producing abundantly since their second year. Over my back patio is a 12′ x 16′ arbor. The vines cover the top of the arbor, and by the end of summer have spilled over the edges and reached the ground so I have to fight my way into the yard. After the leaves fall in autumn I whack them back up almost to the top of the arbor. And that’s it. I don’t water them. I don’t fertilize them. I don’t prune for production. In the spring I admire their loveliness. In summer I appreciate their shade. In fall I and everyone I know eats grapes. In winter I whack. Note: I do not recommend trying this at home! It’s my standard toe-up pattern (think Tangled Up In Blue in plain stockinette). The stitch pattern is *K6, K2tog, YO* repeat. The pattern moves one stitch to the right every round so that the YOs spiral up the sock. The number of stitches that are knit before the K2tog, YO can be modified to fit into any number of total stitches depending on your gauge. I used K6 because my total stitches were evenly divisible by 8. I did do the garter stitch edges on the heel, which is a new thing for me. But I can’t give away all of my secrets! 😉 What sets this sock apart is really the spiral YO stitch pattern, and that can be worked over just about any sock. my son is only 4â€¦â€¦â€¦. reading about yours moving out, makes my heart skip a beat. Hang on tight, Mom. Mine was only 4 just yesterday. It’s amazing how fast it goes. Give him as many hugs as you can while he’ll still let you! I was so worried about food when the son moved out (the nephew finally went to live with his own mom)I was constantly taking car loads of food over. I’m not too worried about mine starving, given that he works in a bakery. But I’ve got to keep that boy warm! I’m sure he’s just not dressing warmly enough. He must have socks. And blankets. And, speaking of #1 Son… today I received an odd call from him asking me how to get to Tangle from downtown Portland. When I asked him why he wanted to know, he replied because I want to go there. And no further information would he give. So, of course I called Alice and told her I thought my son was on his way over there and I had no idea why. Alice, bless her, said you know that I can’t tell you why unless he says I can. I’m fairly certain he’s not taking up knitting. aarrrggghhhh it’s going to kill me! There will be no Homeland Security until we realize that the entire planet is our homeland. Every sentient being in the world must feel secure.